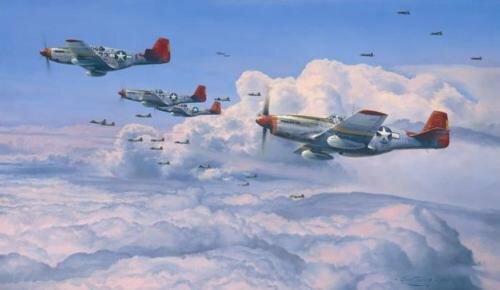 Overall size: 331/4" x 231/2" Image size: 26" x 16"
With their distinctive red tails, P-51 Mustangs of the 332nd Fighter Group – the famed Tuskegee Airmen, climb to operational height as B17 Fortresses from the 483rd Bomb Group manoeuvre into formation at the start of another long and dangerous mission over Germany, Oct 1944. A welcome sight for the Fortress crews, the renowned all-black Tuskegee pilots were credited for never losing an escorted bomber to enemy aircraft. For the first time ever Robert pays tribute to the Tuskegee Fighter Pilots in this stunning portrait of one of the most famous fighter units of WWII.